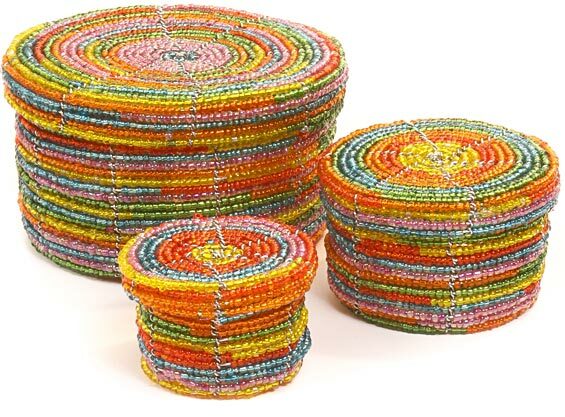 The group that produces these glass beads on wire gems is located in central Kenya. They are members of the Maasai and Kikuyu ethnic communities. The baskets are traditionally given at weddings. The sets of 3 are given from grandmother to granddaughter, usually containing earrings and necklace symbolizing a married woman. Patterns are laid out on paper and then painstakingly translated to the woven object. Wire is manipulated with small pliers as the baskets are woven. You will receive the exact baskets pictured above.